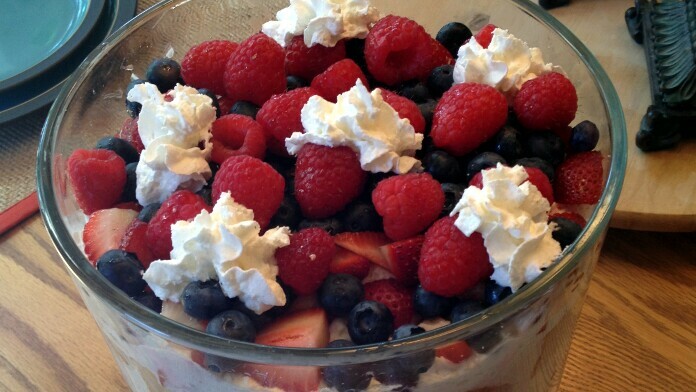 Fresh berries, thick whipped cream, and pound cake make a patriotic and delicious trifle. This non-blender recipe is too delicious not to share, and it's perfect for the summer, whether you're taking it to an Independence Day picnic on the 4th of July or enjoying a beautiful summer evening out on your back deck. While you can pureé the individual fruits into spreadable layers, we prefer the chunky texture. Cut the pound cake into small cubes, about an inch and a half per side. Wash the berries. Hull and halve the strawberries. Pureé the berries individually, as desired. Add a single layer of cubes at the bottom of a trifle dish (or large glass bowl). Cover with a thick layer of whipped cream, then a layer of berries. Repeat until dish is full. Refrigerate an hour. (This allows the berry juice and whipped cream to soak into the pound cake, making it even more delicious.) Serve chilled. For a lighter version of this dessert, substitute sponge cake or angel food cake for the pound cake. We prefer lemon pound cake for the extra tang and zest, but light cakes make light trifles.